The newest Version of the KSC Newsletter is available online here. There are print copies available in the sanctuary if you need a print copy. Wesley-Knox Creative Arts Summer Camps is hiring! Join our team! 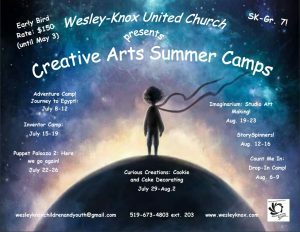 Wesley-Knox United Church is hiring four Summer Camp Counselors for this summer to help co-ordinate and run our Children’s Ministry and Creative Arts Summer Camp programs. For a detailed job description and application details, click here. 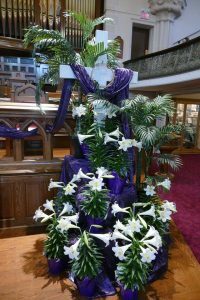 Please plan to attend a meeting that will be held in the sanctuary right after the church service on April 28th. It will be a brief but very important meeting for all of us to attend as we start to look at the future of Wesley-Knox United Church. The final version of our new Constitution has been approved by the Leadership Council, it will be discussed and voted upon. It can be found online here. Please review the details of the Constitution and be prepared to ask any of your questions. The motion, once approved by the Congregation, will include a request to the “Antler River Watershed Regional Council” for Wesley-Knox to operate according to the new constitution. The second part of the meeting will be a presentation by Leadership Council to introduce you to the concepts of the “Faith Profile” (formally the Joint Needs Assessment Committee, JNAC) process of discovery as we begin to move forward with our search for a new Ministerial Leader. We will be running summer camps again this summer. Registration is now open! For more information including detailed descriptions, registration forms and online payment, visit our Summer Camps Page here. 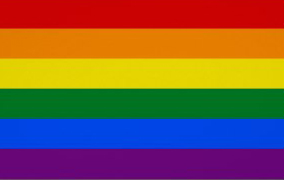 For more upcoming events, check out our Events Page here or our Facebook Page here. Please note that all submissions for the KSC, Wesley-Knox website and Wesley-Knox Facebook page, including photos and PDFs and JPGs of posters, must now be sent to to the Communications Team at communications@wesleyknox.com, not to the KSC Editor or webmaster. The Communications Team will take care of things from there.